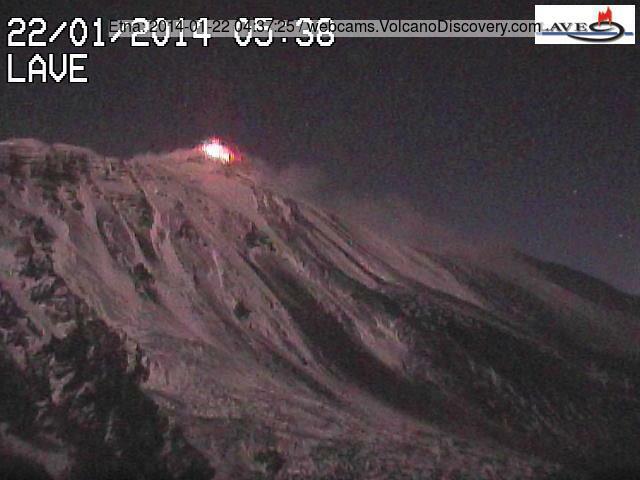 Etna (Sicily, Italy): Since last night, sporadic small strombolian explosions have resumed at the New SE crater. The current tremor signal is low, but if Etna continues its activity as during much of last year, this could be a first precursor to a new paroxysm in the following days. Gorely (Southern Kamchatka): No changes were reported by KVERT. The volcano continues to show intense degassing and elevated seismic activity. Gorely, one of currently 5 volcanoes at unrest or in eruption in Kamchatka remains at Aviation Color Code yellow, along with Bezymianni and Tolbachik, while currently erupting Shiveluch and Karymsky volcanoes are at orange. Karymsky (Kamchatka): The volcano continues to have sporadic small to medium-sized strombolian-vulcanian explosions from its summit crater. Small ash plumes are regularly being detected on satellite imagery. Shiveluch (Kamchatka): Another explosion was reported this morning by KVERT via VAAC Tokyo. An ash plume rose to estimated 27,000 ft (8 km) altitude. Bezymianny (Central Kamchatka): KVERT reports "no detectable seismicity. Moderate gas-steam activity was observed. Satellite data showed the volcano was quiet." Sakurajima (Kyushu, Japan): The volcano had an explosion this morning followed by near-continuous ash venting. The eruption sent an ash plume over Tarumizu town to the SW (see video). VAAC Tokyo estimated the maximum height of the ash plume to 17,000 ft (5 km), but webcam images suggest a significantly smaller size (2-3 km altitude). Overall, the volcano has been comparably calm over the past week. Suwanose-jima (Tokara Islands, Japan): The volcano continues to be in eruption. It regularly has (probably strombolian-type) explosions that produce small to medium-sized ash plumes up to 1-2 km in height. Sinabung (Sumatra, Indonesia): Activity at the volcano continues at reduced rate. The lava dome continues to be active with intense degassing and ash venting, and has produced a series of sporadic smaller pyroclastic flows over the past days. Colima (Western Mexico): The volcano produces small explosions (reportedly 7-12 daily) generating small ash plumes up to about 1 km high. Ash fall has been noted in Ciudad Guzman, Zapotiltic, Tuxpan and Huescalapa in the Jalisco province. Popocatépetl (Central Mexico): The volcano remains at low activity levels with little changes. CEAPRED reported 2 low-intensity emissions of steam and gas during yesterday, and 2 small explosions that produced minor amounts of ash with the largest yesterday morning at 10:28 (local time) producing a plume reaching 1000 m. Crater glow at night is visible. Santa María / Santiaguito (Guatemala): Volcanic activity from the active dome remains more or less unchanged both explosive and effusive. The volcano observatory reports small explosions (on average 1-2 per hour), significant degassing, and weak to moderate block avalanches at the active viscous flows on the sides of the Caliente lava dome. Pacaya (Guatemala): While explosive activity seems to have ceased, lava effusion from the southern fissure vent at the base of the Mackenney cone continues and feeds an active flow field that expands up to 3.6 km from the vent. Fuego (Guatemala): It appears that activity has increased over night. A strong continuous seismic signal (probably tremor) suggests an increase in lava effusion could be occurring. The next update from INSIVUMEH later today will give a better picture. Nevado del Huila (Colombia): A small increase in volcanic-tectonic earthquakes was noted by INGEOMINAS' volcano observatory in Popayán. A total of 138 seismic events were recorded over the past week, out of 112 were volcanic-tectonic quakes and the remaining 26 events related to fluid movements inside the conduits (long-period quakes and one tremor pulse). Machin (Colombia): The volcano continues to be at yellow alert (one of 6 in Colombia) as seismic activity remains elevated, but at low energy levels. Galeras (Colombia): Pasto volcano observatory reports in its weekly update persistent low levels in number and energy of seismic events, no new explosions. Two small volcano-tectonic earthquakes occurred on 15 and 20 January with magnitudes of 2.3 and 2.4 on the Richter scale. Nevado del Ruiz (Colombia): No major changes have occurred over the past week. The volcano produces intense degassing, with steam/gas plumes rising up to 2.5 km above the crater. Seismic activity has remained similar to past weeks at fluctuating low to medium levels. Cumbal (Colombia): Seismic unrest at weak energy levels continues. 5 small earthquake swarms were recorded over the past week, the most prominent having 213 events up to a maximum of magnitude 1.9 during 5 hours on 19 Jan. Most quakes are associated with rock fracturing at shallow depths (3 km) beneath the La Plazuela crater. Pasto reports no unusual surface activity at the volcano. Sotará (Colombia): Popayán volcano observatory reports no changes at the volcano, which continues to show weak seismic unrest.